In the old ‘chai’ (the place where the winegrowers of the village and surroundings brought their grapes to be pressed and stocked) in the centre of Givry, we completely renovated the first floor (190 m2) with natural and high quality materials. We kept the old beams and walls of Burgundian stone to preserve the charm of this typical building. The lodging is very comfortable and spacious. The large living room has floor heating , there a fully equipped kitchen which is one with the dinner room. In the sleeping area you’ll find two suites and one other large bedroom. In each suite there’s a mezzanine so you can sleep with 4 persons, in the other bedroom there is place for 3 persons. Each bedroom has its own bathroom with shower, toilets, towel heating. The fourth bedroom (without own bathroom) has a balcony. Outside there is a private inner courtyard equipped with a table, chairs and a barbecue. There is also private parking space. The local shops and restaurants are at 2 minutes walking from the house, the vineyards at about 5 minutes and the Voie Verte at 10 minutes. 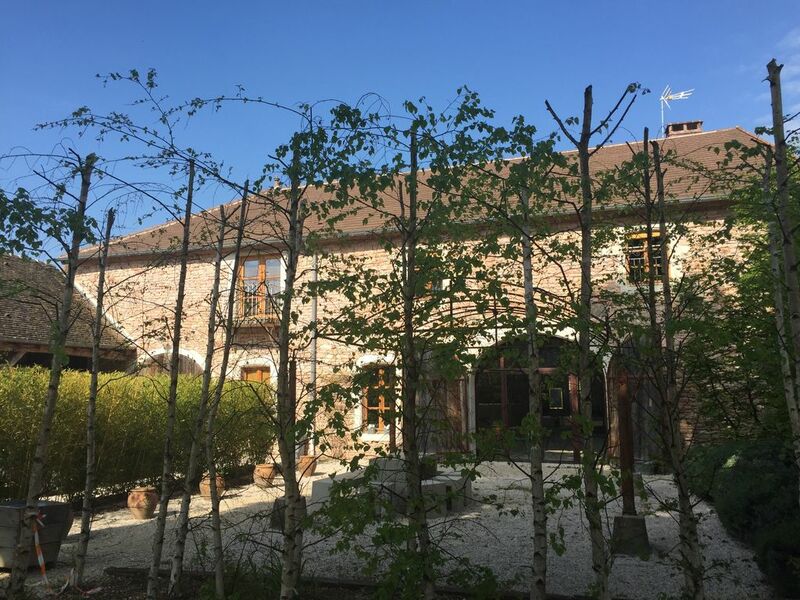 The house is ideally situated to discover the Burgundian wines and gastronomy, the rich cultural villages of the Côte Chalonnaise and to bicycle on the Voie Verte. Givry is at 30 kms from Beaune, at 10 minutes from the highway (Autoroute du Soleil), at 10 minutes from Chalon sur Saône, at 50 minutes from Dijon and Macon. A perfect place for groups (friends and / or family). Fully equipped open kitchen with dining space. To facilitate their trip, the sheets and towels are included for our guests who come from outside of France ! This was a fabulous restoration/remodel of an ancient clos and we loved how it was done. Staying in Givry right downtown was perfect in all respects. Delphine and Lonneke were the perfect hostesses and should they ever come to Colorado, we would love to reciprocate at our home. We had a few extra requests that Delphine was gracious to accommodate. We all expressed our awe in what they accomplished with the old spaces and would have loved to see the photos of the project. It was ideal for 8 adults but easily could accommodate families with children. We had the best time. This home is amazing and beautiful. It was comfortable and clean. The owner was very helpful and very pleasant to work with. Delphine was fantastic! She took great care of us. She went out of her way to be sure we were comfortable and even helped us find food our first night there. Givry is a beautiful town and it was a pleasure to spend our time there. Thank you for one of the most amazing trips ever!! I'll be back with my family again. Hospitalité. Rapport qualité prix et propriétaire de très bons conseils. Localisation idéale pour balades et dégustation de vin. Tous services à proximité. Maison d'exception, mêlant vieilles pierre et déco moderne. Tout le confort, et même plus, à disposition. Absolument fabuleux. Route des Grands Crus: to the West of Chalon-sur-Saône, less than 3h from Paris in TGV, Côte Chalonnaise offers you its wines and hill sceneries. To enjoy all these wonders, follow the Route des Grands Crus, between the valleys of Maranges and Grosne, which crosses 40 towns. Here, for more than 1000 years, the vines planted by the Cluniac monks won over the hills. On the way, you will discover wine-producing estates and impressive winemakers’ houses, witnesses of very old tradition. On their estates, the winemakers will welcome you with much pleasure. To the north of Côte Chalonnaise, they make savoury red wines with recognized appellations, such as Rully and Mercurey, fleshy and fruity wines with a nice ruby colour. Making a stop south, you can savour the fine and delicate white wines of Montagny or Givry. In this last village, they also produce the elegant red wines sought after by Henri IV in his proper time! The Voie Verte (Green Lane - 5 min by bicycle). On the Route des Grands Crus, there is no shortage of opportunities of strolls. On foot, on roller blades, or by bicycle, you can roam on the 32-km of Voie Verte, a true paradise for bicycle touring. This trail, delightfully shaded, follows the Canal du Centre, also open to river tourism. L'Acrogivry (5 min by car, 10 min by bicycle, 2.5 km away). Today Acrogivry became the incontrovertible leisure park of Côte Chalonnaise. 25 courses of which five are new, 5 km of trails, and 1800-m of Tyrolean traverse rope. Many strolls (GR trails on site) or bicycle treks are available outside the house. Visit the castles of South Burgundy (Germolles, Cormatin, Sully, La Ferté, Brancion, and many more). Visit the Roman churches and the typical villages (Chapaize, Tournus, Autun, and many more). Visit an exceptional heritage (Hospices de Beaune, Palace of the Dukes of Burgundy in Dijon, Roman and medieval city of Autun, Chalon-sur-Saône old town, Buxy, Vaux valley, and much more). Experience tasting in Givry and on the wine road. The region is inexhaustible in discoveries, culture, gourmet restaurants, winemaking, and sports (swim in the Laives Lake 18 km away or at the Chalon-sur-Saône swimming pool). There are concerts in Chalon-sur-Saône and festivals such as, the "Musicaves" festival at the end of June in Givry, and the "Chalon dans la rue" festival at the beginning of July. The Givry market, with its local and outside products, takes place every Thursday morning in the square... Restaurants: In Givry, there are several restaurants, including the Annexe, right next door. In Chagny: La Maison Lameloise*** and Pierre & Jean (La Cuisine d'en face). In Beaune: Benaton, Oiseau des Vignes, and Jardin des Remparts. In Chalon-sur-Saône: Amaryllis*, Aromatique, Bistrot, and St Georges. Nous demandons un chèque de caution de 1000€ à l'arrivée (non encaissé).